Water is becoming increasingly scarce and commodified as hundreds of millions of people are denied access to water. The High-level Political Forum (HLPF) will be reviewing SDG 6 “Ensuring availability and sustainable management of water and sanitation for all”. Implementation strategies promoted by international financial institutions have placed a heavy focus on private investment and for-profit delivery of essential services, which are resulting in systemic human rights violations and deepening the very inequalities the SDGs seek to combat. The interactive panel discussion will focus on recommendations to “value water”. 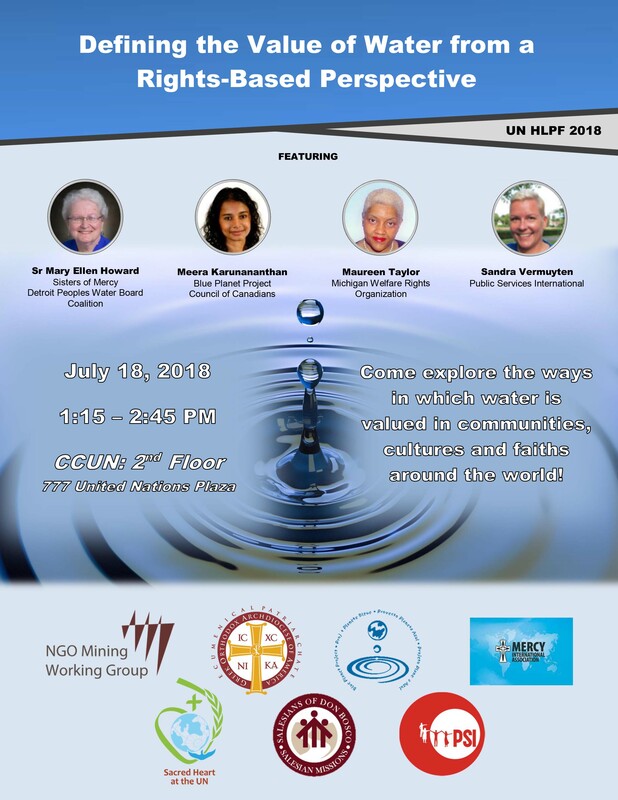 Using a rights-based lens, panelists will explore the ways in which water is valued in communities, cultures and faiths around the world. It will explore the ways in which market-based strategies have distorted these long-held values and further marginalized segments of the population including rural women, Indigenous peoples, small farmers and impoverished communities. In order to be true to the global pledge of ‘leaving no-one behind’, SDG 6 must be implemented through a rights-based approach that prevents the commodification of water and increases public finance and promotes commons-based water resource management. Former Deputy UN Secretary General, Jan Eliasson stated, “[s]afe drinking water and adequate sanitation are not only essential human rights, but are integrally linked to broader efforts to provide well-being and dignity to all people. I commend Member States for recognizing the right to water and sanitation in the 2030 Agenda, and for adopting Sustainable Development Goal 6 to realize it” ("Water & Sanitation, A People's Guide to SDG 6, A rights-based approach to implementation," 2017). Implementation of the SDG’s and the current trend of privatization and market based solutions in relation to water contradicts SDG 6’s purpose: to address major social and environmental ills. The existing emphasis on profit in the delivery of essential services results in predictable and systemic human rights violations for vulnerable populations ("Water & Sanitation, A People's Guide to SDG 6, A rights-based approach to implementation," 2017 p. 5). Prioritize the human right to water over and above commercial use and the current trend of privatization and market based solutions. Highlight the nature of problems in water policy and propose potential solutions. Redefine the concept of valuing water; based on environmental and social needs as well as by integrating spiritual, cultural, religious, etc. customs that are undermined by market based solutions such as pricing.